Check Out Our New 10 Line World Cup Scratch Off Cards! 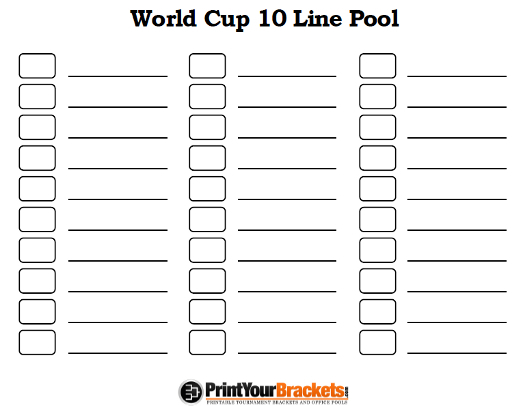 The 10 Line World Cup Squares are perfect for a small number of people. One 10 box grid can be used for any single match, for every game of the World Cup Group Matches or even every game in the actual World Cup Tournament Bracket. This pool is similar to our World Cup Squares with 100 boxes. The print-out below gives you the option to run 3 different pools on one page. If you prefer you can print a single 10 line game here. To run this pool, have the participants write their name on the line or lines of their choice. Once the 10 lines are filled up you will randomly draw the numbers 0-9 placing them in the boxes on the grid. Full instructions on running this pool are available at the bottom of this page. Print a copy or copies of the pool from above and have the participants write their name on the line of their choice. If you don't have exactly 10 people, you can use 5 people with 2 squares each or you can allow some participants to have more squares than others. Place the numbers 0 through 9 in a hat and draw one number at a time. Place the numbers in the boxes starting at the top box and working your way down. There are a couple of different ways to run this pool. The first is to have a winning square for every single game of the tournament and/or group schedule. 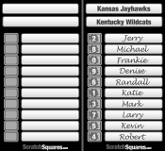 To determine a winning square, you will add the final score of both teams, and then use the last digit of that number. Example: The final score is Brazil 4 and Mexico 3. Add 4 and 3 together to get 7, the person with their name beside the number 7 would win. You would do this for every final score. Remember the print-out from above has 3 separate pools on one sheet. The second way to use these squares is to just use them for any single match. For this method you can have two winners, by using the halftime score and the final score. The winning squares will still be determined by totaling the scores together and using the last digit.